Rev. Jesse Jackson will participate in a Q&A on entrepreneurship and Air Jordans at Bed-Stuy boutique Jordan Heads Brooklyn this Valentine's Day. BEDFORD-STUYVESANT — Sneakerheads and aspiring entrepreneurs can chat with Rev. 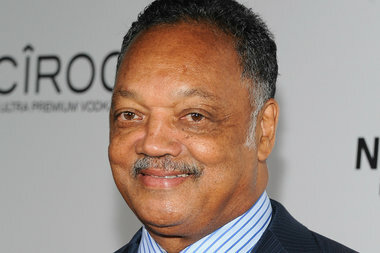 Jesse Jackson at an upcoming Q&A hosted by a Bed-Stuy boutique. Jordan Heads Brooklyn, a Michael Jordan-themed store on Malcolm X Boulevard near MacDonough Street, kicks off its Valentine’s Day edition of its “Flight School” series featuring the civil rights activist. Jackson is expected to discuss entrepreneurship ahead of the annual economic summit from the Rainbow PUSH Coalition, an organization he founded in 1996, according to Calvan Fowler, Jordan Heads’ owner. He’ll also talk about Michael Jordan’s impact on Chicago, any influences he may have taken from the basketball player, his take on the Air Jordan phenomenon, as well as the intersection of hip-hop culture, sneakers, business and youth. The boutique’s “Flight School” series invites actors, designers, celebrities and other public figures to speak about their careers, lifestyles and the Michael Jordan brand, with past visitors including actor and director Michael Rapaport and SLAM Magazine’s Ben Osborne. “We try to leave people with something to think about,” Fowler said. The latest “Flight School” event will take place on Sunday, Feb. 14. at 2 p.m. at 302 Malcolm X Blvd., Brooklyn. Seating is limited and on a first come, first served basis. RSVP to info@JordanHeadsBK.com.